Playwright Bruce Norris’s Clybourne Park takes a while to get going, but once it does, it’s as funny as it is thoughtful. It’s a satire of American society in 1959 and the 21st Century, as seen through the lens of real estate in a residential Chicago neighborhood (the same one the Youngers moved into in Lorraine Hansberry’s A Raisin in the Sun). 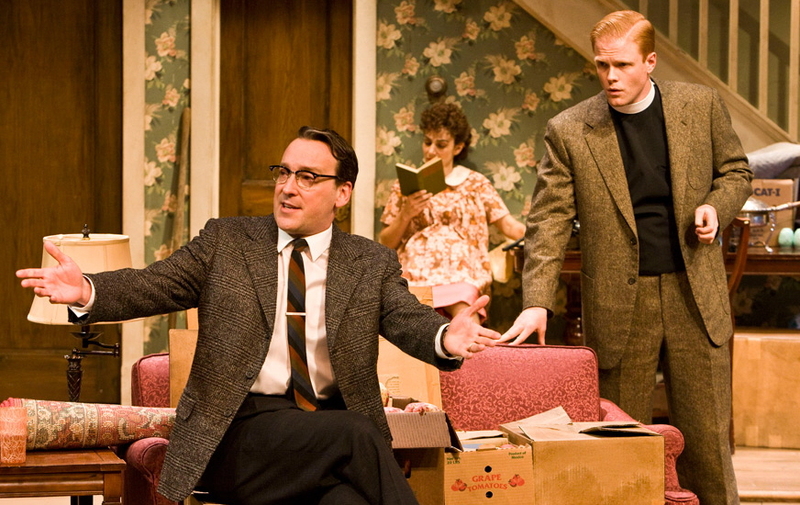 Act One takes place in 1959, as an unseen black family is about to move into the Clybourne Park house being sold by troubled couple Russ (Frank Wood) and Bev (Christina Kirk). Act Two is set in the same house in 2009, as the house, in the now predominantly African-American neighborhood, is being sold to a white couple. Playwright Bruce Norris spends the first 20 minutes or so of the show milking the naïveté of late 1950s mid-America for all the comedy he can get out of it. Just as this threatens to get grating, though, the conversations Russ and Bev have with each other – as well as with their minister Jim (cute ginger Brendan Griffin) – begin to touch on more serious matters, both personal and political. Norris writes in a very pungent, aggressive way; in some of his previous plays this has made it difficult to connect with his characters. Here, though, it serves his subject matter so well that it invigorates rather than annoys. Director Pam MacKinnon applies a light touch that aids in bridging that gap. The cast is uniformly fine, with Wood’s stoic portrayal of Russ standing out – rarely has a stage actor communicated so much with such minimal means. Norris has accomplished that balance between entertainment and insight, which to my taste is so essential to really good theatre-making. Clybourne Park is quite good, and I’m really curious to see where Norris goes next. Loved this show and I think your review does it justice. Glad to see that it’s picked up some Tony noms for its work.